-The following guide includes instructions for basic tuning that should be performed on a regular basis. - Read through the entire guide before you begin. Key Points:a. Always work from tip to tail. b. Base edge before side edge. Photo 1, L-R: copper, nylon and horsehair brushes from ARTECH.com, a brick of Swix CH10 warm wax, a thick rubber band (brake retainer), 2 spring clamps. 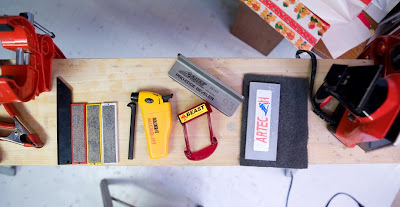 Photo 2, L-R: true bar, 3 Moonflex brand diamond stones (200, 400, 600 grit), black p-tex candle, butane lighter, SVST brand 93 degree side edge guide, “Beast” brand 1 degree base guide, plastic Artech brand scraper, fibertex pads (underneath scraper), Swix iron, all on top of a regular work bench/sawhorse, mounted with a 3-piece Swix ski vice set. Step 1 – The Brakes: This should be common sense, but figure out a way to keep the binding brakes pulled back when tuning. 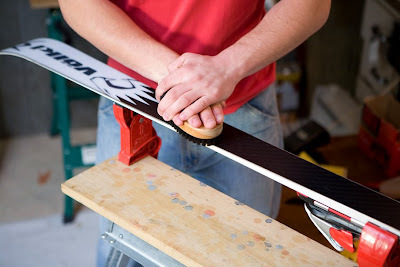 Heavy-duty rubber bands work great, and are available from online ski tuning stores. 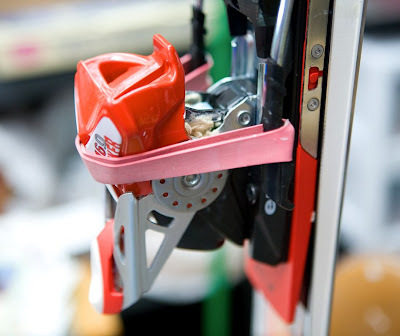 Vacuum cleaners also use heavy duty rubber bands, so check around a hardware store for a cheap alternative. 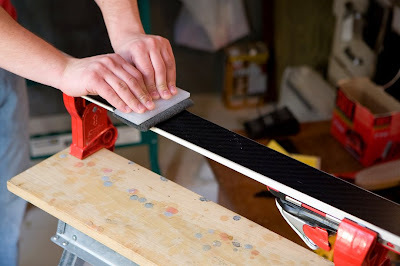 Step 2 – Set-up: Secure the ski using vice grips, or by your own creative method, so that the ski is level and the base is facing upwards. The ski should be secure - enough so that it cannot be knocked off the table and will be able to withstand the motions of brushing and waxing. a. 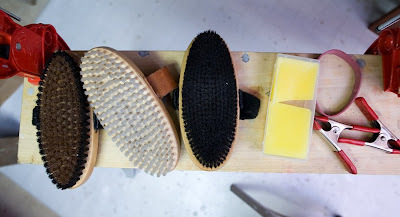 Start by brushing out the base with your brass brush (can be substituted for nylon brush). This will clean the base structure of all the gunk from the last time you skied, so that you do not unintentionally work the dirt into the base while tuning. If the bases are visibly dirty, use some wet paper towels to clean them off. b. When brushing, always work from the tip of the ski toward the tail. Use both hands on the brush, and brush the ski with moderate and even pressure from tip to tail. This is NOT like brushing your teeth or cleaning the grill; you are not scrubbing the base, you are brushing it. Avoid putting all your weight over the brush. It helps to mentally divide the ski into a few small sections, and overlap the brushed sections as you move toward the tail. Brush the ski 3-5 times, or whatever feels appropriate. Side note: If your skis are just coming from a stone grind, use Fibertex to knock down the tiny burrs on the base that get kicked up during a grind. Think of it like sanding down a freshly cut wood surface. I usually fold the fibertex pad in half, and put a scraper or other flat object on top so that the pad contacts the ski evenly at all points. Use similar motions as brushing, but do it as many times as you can possibly stand. As in, 50-100 times. It takes a lot of work to get your base fast after a grind. Brush with a copper/brass brush at regular intervals while fibertexing to raise up any remaining burrs to be broken down by the fibertex.